The speleologists - namely Guido Rossi, Marcel Paul, and Joni A. Bonifacio - discovered the tooth sticking out of the limestone wall of the Taguloulou Cave in the town of San Jorge in Samar. The fossilized tooth is believed to belong to a Megalodon, an extinct species of shark that roamed the Earth's oceans around 15.9 to 2.6 million years ago. 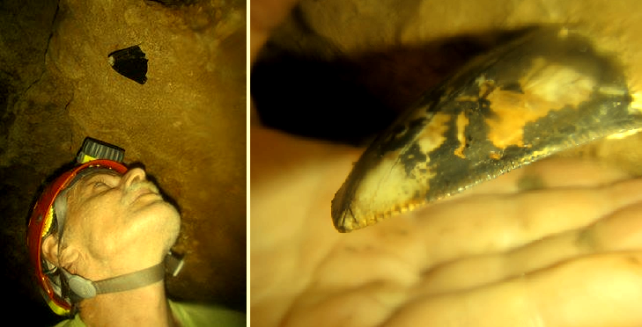 In a video posted on YouTube by Bonifacio, the speleologists can be seen scrutinizing the tooth which is embedded deep into the cave wall. Only about 1/4 of the tooth is visible because most of it is covered in limestone. It's yet to be 100% verified if the tooth is indeed belonging to a Megalodon. However, the features that can be seen from the exposed portion of the tooth points to it being a Megalodon tooth. The serrations on the sides of the tooth, its large size, and its triangular shape are features of a Megalodon tooth. The Megalodon shark lived and thrived during the Cenozoic Era. Based on fossil remains, the Megalodon is believed to be able to reach lengths of up to 18 meters. However, some scientists hypothesize that the sharks can grow up to 30 meters. 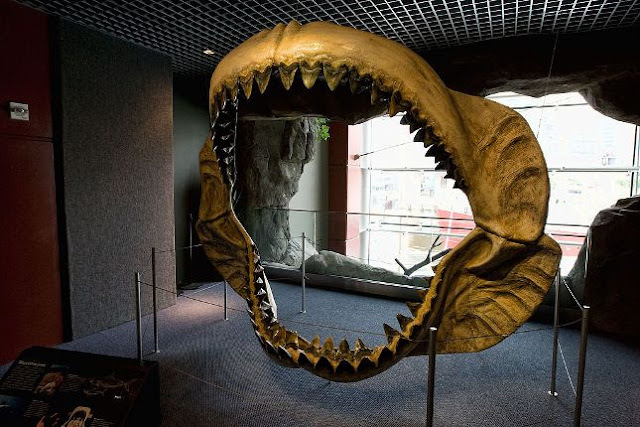 The Megalodon's teeth are the largest in any known shark species. They can reach lengths of over 180 millimeters or 7.1 inches. The sides of the teeth are serrated which greatly improved the efficiency of the sharks in slicking the flesh of their prey. Studies show that the Megalodon was a super-predator which means it preyed on a lot of marine animals including other sharks. As to why the Megalodon went extinct, scientists are not sure but they put out four possible reasons. One, the oceans cooled. Two, the sea levels dropped. Three, there was decline in their food supply. And four, new competition arrived. The Megalodon is also often referred to as the megatooth shark, monster shark, or giant white shark. It has been the subject of several books, movies, and documentaries by National Geographic and the Discovery Channel.